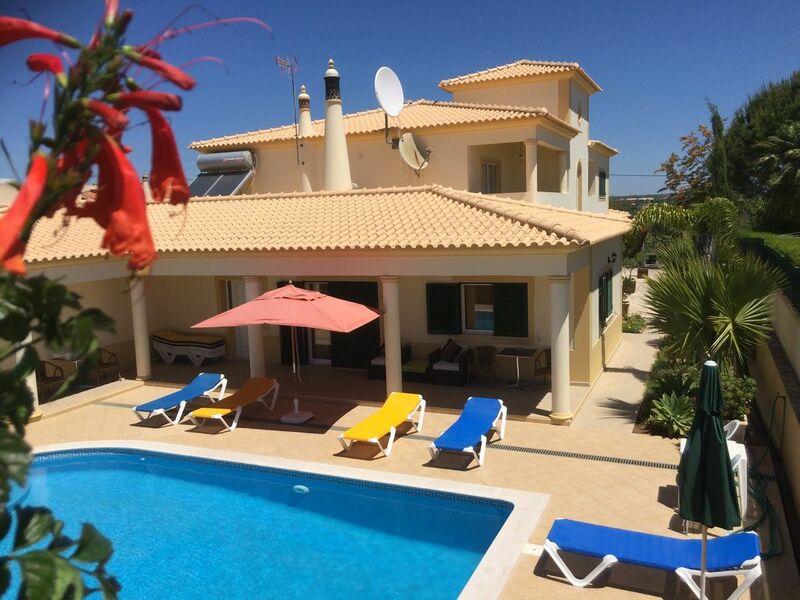 Villa Eber is a spectacular villa situated near beaches and Old Town of Albufeira and consists of 4 separate rental units: 3 air conditioned apartments, two 2 bedroom apartments and one 1 bedroom apartment and smaller unit - a double bedroom with bathroom. All apartments are independent, fully air conditioned with modern kitchens and full bathrooms, satellite TV with English speaking channels, CD/DVD, free and unlimited WI-FI, safes and balconies or veranda. Beautifully kept garden with a large swimming pool, sun loungers and umbrellas. Private secure parking inside the property grounds. The villa enjoys a superb location in a very quiet area close to golf courses, water parks, Marina, Zoomarine, Algarve Shopping and is only 3 minutes drive ( €5.00 by taxi ) from the capital of tourism in the Algarve the town of Albufeira with great restaurants, unforgettable nightlife and beautiful golden beaches. The apartment is fully air conditioned with 2 bedrooms ( twin and double ) both en-suite with full bathrooms with baths and overhead showers, modern kitchen with ceramic top cooker, microwave, dishwasher, toaster, kettle, etc. living room with satellite TV with English channels, CD/DVD and safe. FREE and unlimited WI-FI available in the apartment. -First floor 1 bedroom apartment. -First floor 2 bedroom apartment. -ground floor double room with bathroom. Villa Eber is very popular with couples and families looking for peace and quiet in a quality villa accommodation, close to old town of Albufeira. Many of our regular guests come back every year and enjoy the quality of staying in the villa in it’s own apartment at very reasonable cost. The swimming pool is over 1,60 cm deep and the villa is suitable for children from 11 years old but we would be delighted to accommodate the little ones in another property - please ask for more details. Villa Eber - more details: All three 1 & 2 bedroom apartments are spacious, comfortable, with modern kitchens and bathrooms, fully air conditioned with balconies or veranda, satellite TV with English channels, CD/DVD, now FREE and unlimited WI-FI, and safes. For guests not requiring a kitchen we also have DOUBLE BEDROOM with private bathroom. Surrounded by beautifully landscaped garden Villa Eber offers its guests an outdoor swimming pool with umbrellas and sun loungers. Private secure parking inside the property grounds. Maid service is provided 3 times per week with change of linen once per week and change of towels twice per week. Please remember to bring your pool/beach towels. A perfect setting away from the crowds for maximum relaxation. We can guarantee you a stress free holiday ! For guests wishing to rent a car we can make arrangements with a local car firm at competitive rates with efficient and personal service. You can pick up the car at Faro Airport or have it delivered direct to Villa Eber. We can also reserve private airport transfer from Faro Airport. The driver will await your arrival and bring you direct to the villa. The costs is from €36.00 for 2-4 people and €48.00 for 5-6 people and the journey usually takes about 35 minutes. There are two excellent local restaurants within 10 minutes walk and there is a local cafe just 50m from the villa. Ideal if you like country walks. Just around the corner from the villa is a long country lane where you can enjoy the beauty of Algarve countryside. Zoomarine and water parks are 10-20 min. drive. Golf courses are only 10-15 minutes by car and sandy beaches of Albufeira and new marina about 4-5 minutes. A superb choice for your dream holiday at unbeatable price ! - 25% deposit required when making a reservation. Balance ( 75% ) is payable 6 weeks before arrival. Secure payments with a credit card direct to HomeAway. I am Andrew and together with my wife Ana have been renting holiday accommodation in Albufeira for over 20 years and have advertised on HomeAway since 2001. We both enjoy sailing and going in the winter to cooler places for some skiing. We love the Algarve, it’s superb warm climate, the sea food, grilled food and the wine ! We would be delighted to welcome you at Villa Eber. Our maid can wash your laundry in the basement laundry room at €5.00 per wash payable locally. Bathroom towels are provided. Please bring your own beach / pool towels. Pool for use only of guests staying in apartments at the villa. Andrew and his wife couldn’t have been more helpful. Our villa was very comfortable, containing all we needed and was spotless. Pool area was great and again very clean. Nothing negative to say at all. Thank you very much for your great review, we are really happy you have enjoyed Albufeira and your stay at Villa Eber. Thank you for looking so well after the apartment and leaving all so clean on departure. Hope to hear from you in the near future, if you decide to return to the Algarve. Great villa and very relaxing. Villa Eber was a lovely place to stay, whilst on holiday. It was extremely clean and well maintained. Everything we required was provided and the setting was very quiet and peaceful. The owners, Anna and Andrew were amazing and bent over backwards to accommodate us. For instance, my son burst his inflatable on the 3rd day but Andrew came to the rescue with other inflatable pool toys he could borrow instead. We were lucky enough to have the pool mainly to ourselves at the times we used it. Everyone that we came across was friendly, considerate and respectful. The villa is a short distance out of the town but that helps add to the peace which allows you to relax. Both of the owners help and give advise, so you can get the best out of your stay. A quite location, very comfortable and spotlessly clean it was a haven away from busy Albufeira. Ana and Andrew couldn't have been nicer, they were so welcoming and perfect hosts and were there if we needed them. My husband and I were there with our (adult) daughter and had the 2 bedroom, 2 ensuite apartment that was cosy and spoltlessly clean with regular cleaning and towel change. It was so comfortable, a real home away from home! It had everything we needed. The apartment was approximately 30 minutes walk from the old town in Albufeira which really suited us as we love to walk and didn't want to be in the heart of the hustle and bustle. The pool area and quite veranda were such a bonus. Thanks so much Ana and Andrew for making us feel welcome, I really enjoyed our chats. I would highly recommend this property. Thank you very much for your superb review, we are really happy you have enjoyed Albufeira and your stay at Villa Eber. Thank you for looking after the apartment so well and leaving so tidy on departure. We wish you a good summer back home in Ireland and look forward to hear from you sometime in the near future. Thank you very much for your review, really happy you have enjoyed holiday in Albufeira and your stay at Villa Eber. Look forward to hear from you sometime in the near future if you decide to return to the sunny Algarve. First time here and it was beautiful. Andrew is brilliant. Can't wait to return next year. Thank you very much ! What a fantastic review ! Ana and myself are really delighted you have enjoyed the Algarve and your stay with us. Thank you for leaving everything so perfectly clean in your apartment on departure. The weather continues very warm with 30ºC in Albufeira today which is warm for October and it feels like middle of the summer. Welcome back anytime when you are ready for another break in Albufeira. This was our second stay at Villa Eber and happy to say that it was just as good second time round after a gap of a few years. The listing is accurate and we can only echo the other reviewers as to how good the villa is. Everything has been thought of and the villa is extremely clean and well cared for. The hosts are absolutely charming and gave us such good advice and tips for our stay. Truly, nothing was too much trouble! We had a car, so the villa was an ideal base, but it is an easy walk to the nearest shop/restaurant or a short taxi ride into the old town or strip area at night. We would happily recommend this property, or any other of the owner's properties (We have stayed at some). We certainly won't leave it as long before returning again! guests when looking for that perfect place for their next holiday. Thank you for leaving the apartment so clean and tidy on departure. for another break. You are a lovely couple and you are welcome back anytime. Algarve is a region renowned for its mild and sunny climate,its miles of glorious sandy beaches with their stunning rock formations and its excellent sport facilities.It boasts an average of 3000 hours of sunshine per year.It's mild all year round with virtually no rain in the summer months.February sees the start of the spring and it's warm in October.The Old Town of Albufeira which perches on the cliff top overlooking the beach, retains a distinctive Moorish character and you can still see the fisherman bringing in their catch at the port entrance near Albufeira Marina. There are 2 excellent local restaurants within about 10 min walk from Villa Eber and another one during the summer months at the near by Clube Albufeira with famous barbecues on Wednesday nights. The nearest supermarket is at the Camping, about 8 min walk and a larger one about 12 minutes walk. Algarve Shopping with food store, many restaurants, bowling and cinemas is only a few minutes by car as is Zoomarine,water parks and golf. Golf: There are currently 25 courses in the space of 100 miles of coastline, with more under construction. Most of the Algarve golf courses are within half an hour drive from our villa, some only 10-15 minutes. Over the last few years the Portuguese Open has been hosted variously at Penina, Vila Sol and Sao Lourenzo, all of which may be included in the list of top European championship courses. Warm playing conditions and immaculately manicured fairways and greens are the norm in the Algarve. Whatever your level of skills or dedication there is a course for you in the Algarve.